If you own a landscape business and are looking for a competitive edge this spring and summer, converting your fleet to propane power could be just the ticket to kicking your bottom line up a notch: propane is less expensive, more eco-friendly, and cleaner-burning than gas, which means your equipment will last longer and perform better. Propane will also help you compete for work with even the most environmentally demanding customers. Still, making the switch to propane isn’t a decision you should jump into lightly; like any investment, it takes time and research to discover if propane conversion is right for you. Once you do decide to make the switch, however, you’ll need to do it right. Here are five key steps to take when making the switch to propane power for your landscape business. Establish a relationship with a reliable propane provider – When it comes to navigating the ups and downs of propane conversion for your landscape fleet, nothing beats the experience of having “been there and done that.” A qualified propane supplier can help you make better choices for your fleet, refer you to important propane resources, and support you with quality propane and propane services for the lifetime of your equipment. 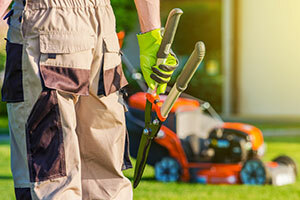 Determine if you should buy new or convert – Many OEMs now offer new, propane-powered versions of popular lawnmower models; if you choose to buy new propane landscape equipment and were comfortable with a particular model of gas-powered mower, see if a propane-powered version is available. Many alternative fuel incentive programs require EPA-certified propane-fired equipment, so be sure your conversion passes federal muster. Laws often forbid the modification or removal of OE emissions reduction and fueling equipment; make sure your conversion is legal. Engine and equipment manufacturers may void their warranty if conversions are undertaken on your equipment; make sure your conversions are covered. Again, research is key – as is working with a knowledgeable propane supplier. Consider applying for incentives – Incentives can save you hundreds or even thousands of dollars on your switch to propane. PERC’s Propane Mower Incentive Program (PMIP), for example, provides recipients with up to $1,000 for a qualifying new OEM propane mower or $500 for a qualifying conversion of a gasoline mower to propane. Your local Propane Gas Association can help you learn about additional incentives; to find a PGA near you, visit NPGA.org. Local, state, or federal incentives are also available – see dsireusa.org for details. Determine the best refueling options for your fleet – The logistics of fueling can have a big impact on the efficiency of your operation – and on your bottom line. Working with your propane supplier is once again the key here; a good supplier will know the best way to meet the unique propane delivery needs of your business given the unique rules that govern the way propane may be used, stored and handled in your area. Do your marketing legwork – The newfound efficiency and eco benefits of your propane landscaping fleet can give your company an advantage in increasingly competitive markets –if you can demonstrate them. Make sure you to accurately track your fuel costs, performance record, and maintenance schedules for your new or converted propane units compared to your old gasoline or diesel units so you can position your company as an efficient, green alternative to your competitors. Considering a propane conversion for your commercial lawnmowers? We can help! Contact our experts today to discuss propane-powered options for all kinds of landscaping equipment – including your truck fleet!